Benefits: Support for lower back. Eases menstrual cramps. Quiets the mind. Forward folds allow reflection. Please note that while we do a prop-less version of child's pose in almost every yoga class, this is not an easy pose! Most of us are not used to sitting on the floor or used to spending time on our knees and lower legs for extended periods of time. This supported and restorative version is well propped up to aid in holding for a longer period of time. However, with all restorative poses, we don't want to hold with discomfort. Listen to your body and modify. Props: One sticky mat. Two blankets. One rectangle bolster. Two blocks. One D-ring strap. Prepare: Begin by looping your belt around your bolster lengthwise. It should be tight enough to support your hands in between the bolster and strap with it's tension. Set up your blocks at an angle so the flat edge of the block is on the bolster at an angle. The one near you head will be on the tallest setting, the second on the medium facet. Place the bolster gently on the blocks at a 45 degree angle. Take a blanket folded into a long rectangle and drape it over your bolster. Smooth out any bumps and wrinkles. I used a second blanket folded into a square cube to place at the bottom edge of my bolster. You can also you another block if you have three. Make sure your props are stable! Shape: Come to sit on the blanket cube (or block) with your knees along the sides of the bolster. Your toes will be going towards each other behind you. 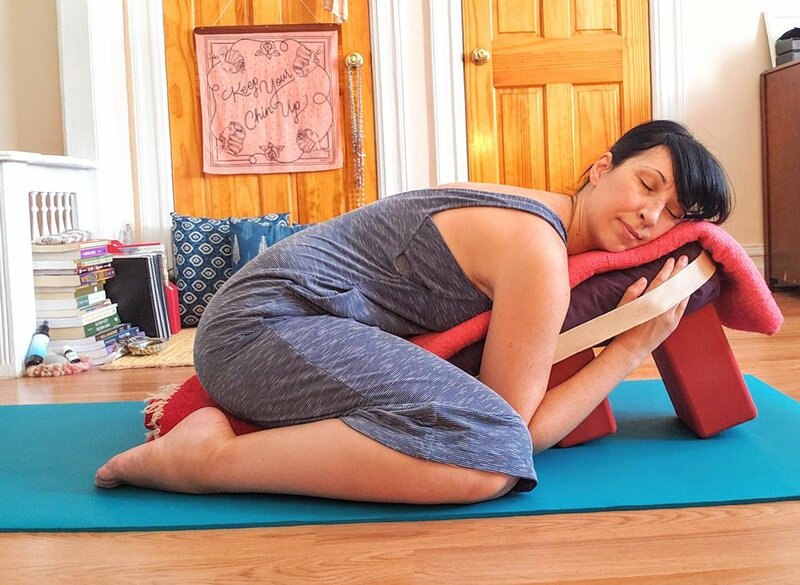 In this version of Child's Pose we want our head above our pelvis, so you may add more blankets to suit your shape draped on the bolster or between your upper thighs. Come forward and rest your front body on your bolster. If you are chilly or wish for more grounding lay a blanket over your lower back. Set your timer and slip your fingers through the belt. Bring one cheek to one side. Be sure to switch your head to the other side half way between your pose if that is available to you. Practice: Make any adjustments necessary to ensure that you are comfortable. When ready to settle into pose, enjoy several long breaths to allow yourself to relax. Feel the support from the floor, or imagine mother earth below you. Relax, and deepen into this grounded feeling for 10 to 20 minutes (shorten this time if there is discomfort to your knees or any discomfort of any kind). Come to notice your breath. Take note of your inhales and exhales. No need to change your breathing pattern but just observe. Let go of the thoughts that enter your mind. If that becomes difficult, come back to noticing your breath. Close your eyes if you wish.